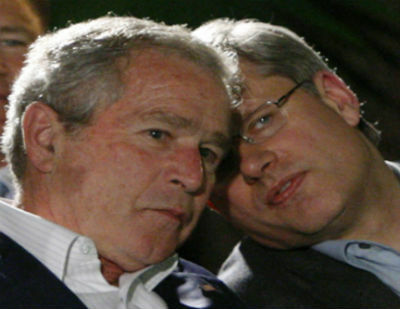 DALLAS — Canadians are storming Twitter in outrage after George W. Bush let it slip today that he has sold his portrait of Prime Minister Stephen Harper to the Canadian Government for an eye-popping $1.5 million. That’s $1.98 million in nose-diving Canadian “loonies”. The behind-the-scenes deal was reportedly struck after Mr. Harper ordered Minister of Democratic Reform and Patriotism Pierre Poilievre (pronounced “Poooh-le-very”) to “buy that national treasure at any cost” according to today’s Dallas Star. “Look. 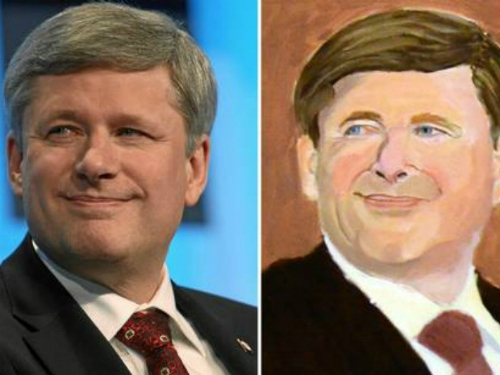 Haters gonna hate but this truly mesmerizing painting of Prime Minister Harper belongs in the National Gallery of Canada so all Canadians can see their leader as another former world leader sees him,” Poilievre told the Star this morning. Canadians only learned late last night of the Harper government buying the Harper painting for what art critics are calling “a criminally high price for a kindergarten painting.” A NY Times reporter posted that the news made her “spew Fruit Loops out her nose” earlier this morning. 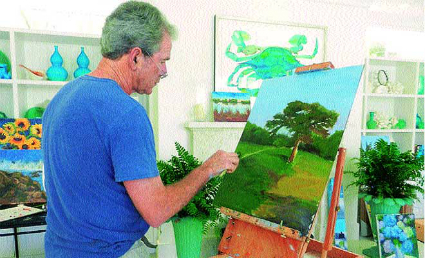 Former President Bush (69) took up painting in 2012 and has worked in oils and watercolors to paint world leaders, sunsets, his dog, and 32 selfies including several of himself in the shower and bathtub. 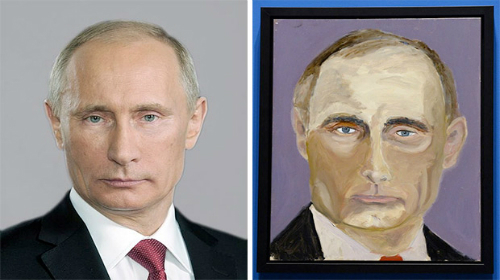 None of his paintings have sold prior to the Harper piece but Russian President Vladimir Putin is reported to have offered Mr. Bush 28,000 rubles ($500 U.S.) to burn the picture of him. “I was going to put the Harper painting in a garage sale but then Stephen called me up and said he wanted it for Canadian postage stamps,” said Bush from his Texas dude and artist ranch. Enraged Canadians have begun calling for an FBI investigation or at least for the Royal Canadian Mounted Police to notice. Harper’s official Twitter site began posting only glowing comments about the Prime Minister early last week and that continued today with any mean comments on Bush’s Crayola No-Tears Paint portrait of Mr. Harper being deleted within seconds.